I’ve been spending a lot of time testing new dessert recipes recently and I feel a return to chocolate coming on, hence these Black Sesame Matcha & Passion Fruit Candy Bars. 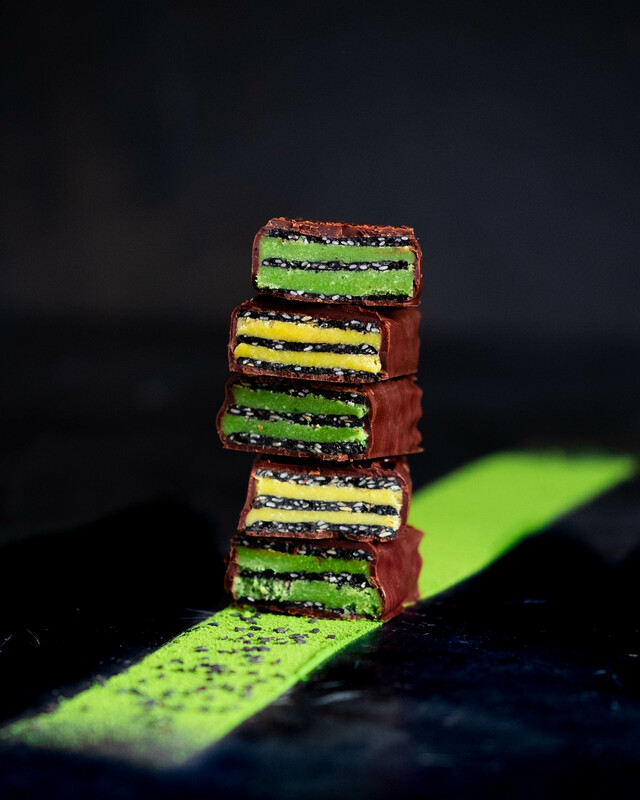 Thin black sesame wafers layered with matcha and passion fruit pralines. I love the striking colours and flavours in these bars. The passion fruit really stands up against the darkness of the sesame and chocolate, it cuts through that richness with it’s tart flavour and delicate aromas. Thin black sesame wafers layered with matcha and passion fruit pralines. I love the striking colours and flavours in these bars. 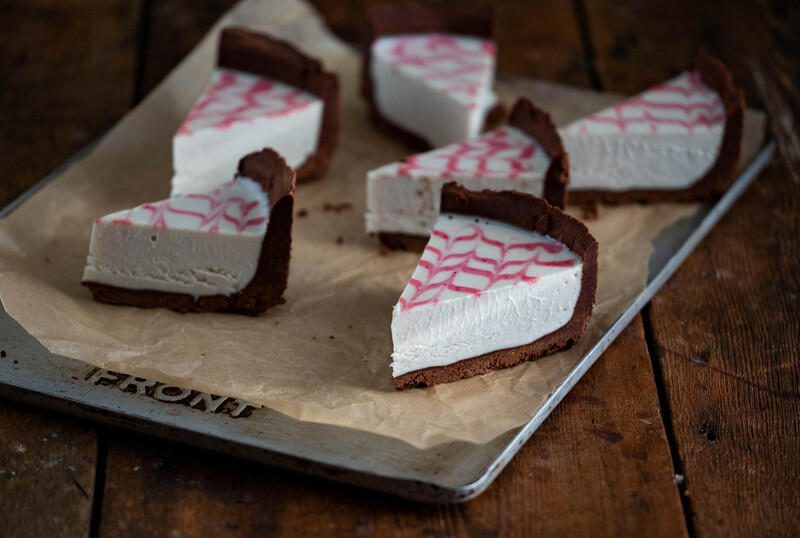 The passion fruit really stands up against the darkness of the sesame and chocolate, it cuts through that richness with it's tart flavour and delicate aromas. When straining the sesame seeds, suspend them in a strainer / sieve over a bowl for about 5 minutes to be sure they have drained as much water out as possible, otherwise they will get diluted by the excess water. Transfer the strained sesame seeds to a food processor and add all remaining ingredients. Blend until well broken down, the sesame seeds can remain whole, if they aren't blending smooth. Score the mix into the size you desire the bars to be - this is the cutter set I used to score mine. Dampen the cutter between scores to ensure it cuts clean and doesn't stick to the dough. Once it’s firm and dry enough, flip onto a mesh tray and dry for another 15 hours, or until crisp and dry throughout. Break them along the scored lines and store in an airtight container at room temp until you’re ready to use them, or up to 4 months. Mix together all ingredients for the individual pralines - in separate bowls. Add the freeze dried fruit powder and mix to combine. Pop in the fridge 10-15 minutes to firm up enough to spread on the biscuits. Once ready, spread an even layer on 2 biscuits, stack them one on top of the other and one more biscuit on top to finish. Press them gently to push the praline to the edges of the biscuit. Remove the excess praline and place the bars on a greaseproof lined tray to set in the fridge about 15 mins or until firm. 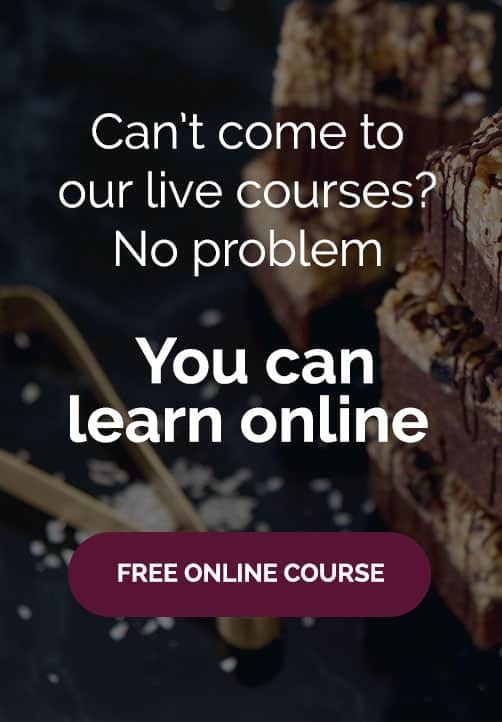 Enrobe in dark chocolate and serve. These will keep up to 2 weeks stored in an airtight container in the fridge, but are best eaten as fresh as possible. 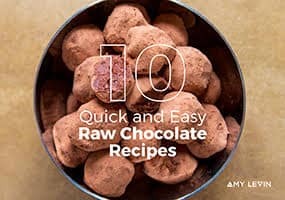 If you don't know how to enrobe or how to make and temper your own chocolate, click here and join my free raw chocolate mini course and learn how to do it all in a few short, simple videos.